Airservices is the government-owned corporation responsible for providing air traffic management and aviation rescue and fire-fighting services in Australia. Each year we manage more than four million flights across the country involving some 90 million passengers, including those operating to and from Rockhampton Airport. Aviation is critical to the broader economy and effectively links our people with each other and the rest of the world. Airservices continually improves and updates navigation systems into Australian airports to make air travel safer and more predictable. The navigation systems used by aircraft at Rockhampton Airport are to be updated to the latest available technology in August 2017. What is being changed and why? Satellite based arrival and departure routes are being implemented. A growing number of modern aircraft are now fitted with navigation systems that use satellite assisted guidance. Specialised flight management systems in the cockpit can use Global Positioning System (GPS) information to fly aircraft with a higher accuracy. These systems are known in aviation circles as Required Navigation Performance (RNP) –meaning the aircraft can perform with a strict set of navigation parameters. These routes are designed to improve safety and predictability at Rockhampton Airport, particularly during inclement weather and at night. Where are the new tracks at Rockhampton? The proposed flight paths have been designed to overfly residential areas that are currently being overflown now, or to fly over non-residential areas. These flight paths are generally only expected to be used when weather conditions are poor and at night. During fine weather most aircraft are expected to fly as they do now. Will I notice any increase or change in noise? Changes to aircraft tracking may be noticed by some residents to the north and east of Rockhampton with noise levels not expected to increase. Aircraft will commence using these procedures mainly during periods of poor weather and at night from 17 August 2017. Airservices is implementing standard arrival and departure routes at Mackay Airport to improve safety and the predictability at Mackay. These routes are expected to be used during periods of inclement weather and at night, during fine weather aircraft are expected to track as they do now. When these routes are in use residents may notice a greater consistency of where aircraft are tracking, particularly during poor weather or at night. When aircraft are departing to the north, the areas of Mt Pleasant and Glenella are expected to notice this consistency. More information can be found on our Fact Sheet. 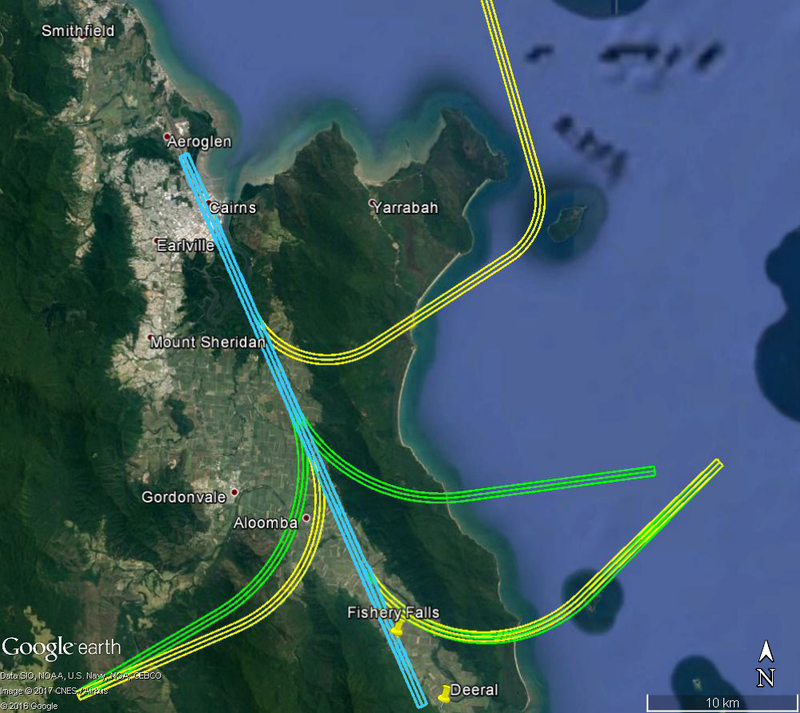 On 22 June 2017 Airservices is updating the Smart Tracking procedures for aircraft landing at Cairns Airport. This is part of a nation-wide program to provide additional aircraft with safety, landing predictability, fuel and emissions benefits. This also provides opportunities to look for ways to improve noise outcomes. Smart Tracking flight paths have been updated to follow existing flight paths as closely as possible and most changes are over water. The image below shows that the Smart Tracking flight path from the south west to land at the airport from the south has moved from west of Aloomba (in green) to east of Aloomba (in yellow). Noise levels are expected to be similar to those from existing arriving flights but the community of Aloomba may notice a change in where aircraft are tracking. The Smart Tracking flight path from the north east to land at the airport from the south keeps aircraft just to the west of Fitzroy Island National Park as shown in the image below. The Fitzroy Island community may notice arriving aircraft west of the Island. This area is currently overflown by departures. Click to enlarge the image and use your browser “Back” button to return to this page. Canberra has a modern aircraft fleet and in response to public demand the number of flights is forecast to grow by over 30 per cent by 2020 (compared to 2012 levels). Smart Tracking aircraft will be the cornerstone technology to cater for this growth in a sustainable way. To enable a wider range of aircraft to use Smart Tracking at Canberra Airport, Airservices is implementing new international standard Smart Tracking procedures on Runway 17 and 35 to improve safety, noise and emissions outcomes for Canberra Airport. The updated Smart Tracking arrival flight paths closely replicate the existing Smart Tracking arrival flight paths, with minor changes occurring within existing flight path corridors. Residents may notice small changes to aircraft tracking however these changes are not expected to result in a noticeable difference in noise levels. The updated flight paths will be available for all suitably-equipped operators from 25 May 2017. No new areas will be exposed to aircraft noise as a result of the updated Smart Tracking flight paths, as these areas are already overflown by aircraft. There should not be any noticeable difference in aircraft noise. Runway 17 – Smart Tracking arrival flight path from 25 May 2017 shown in yellow. 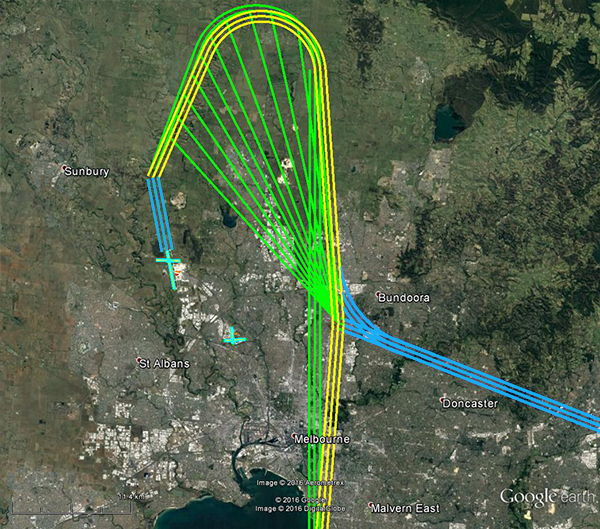 Smart Tracking arrival flight path pre-25 May 2017 shown in green. Runway 35 – Smart Tracking arrival flight path from 25 May 2017 shown in yellow. Smart Tracking arrival flight path pre-25 May 2017 shown in green. Smart Tracking was trialled at Canberra from 2006 by one airline and was made permanently available in February 2013. Seven tracks are used for aircraft arriving to Canberra Airport. 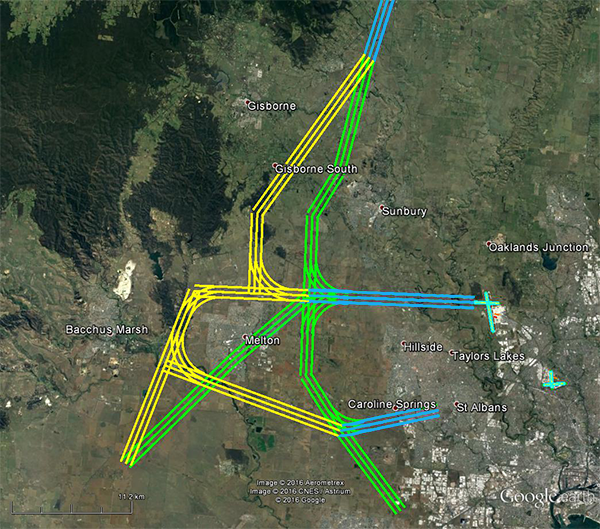 Each track is within an existing flight path corridor and replicates those used in the trial. To achieve the best aircraft safety outcomes for Canberra, Airservices is working towards making Smart Tracking technology permanently available for all suitably equipped aircraft landing at Canberra Airport. Implementation will be designed to maximise noise and emissions benefits. 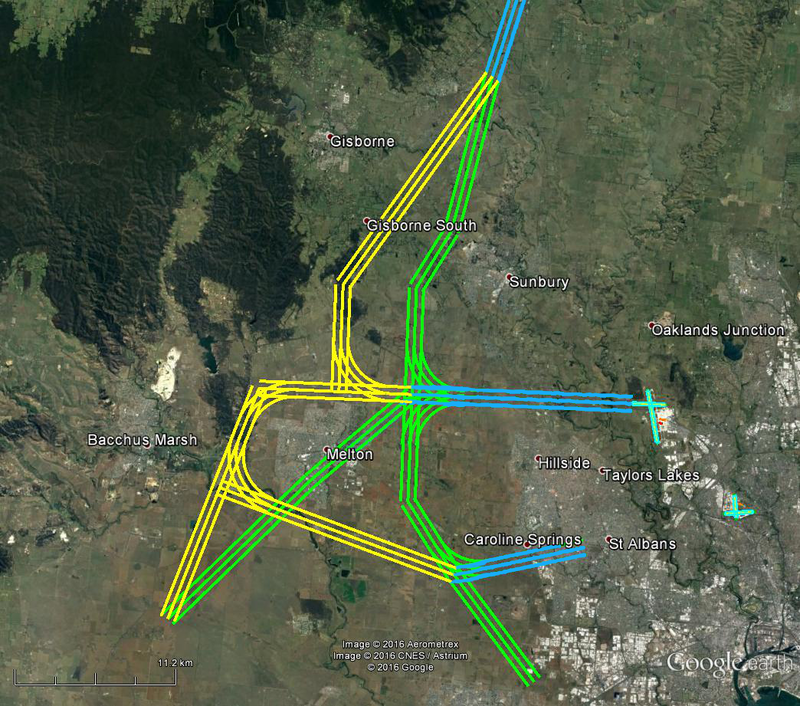 Smart Tracking has been successfully trialled at Canberra since 2006. The trial has been accepted by the community with no evidence of concerns being raised. 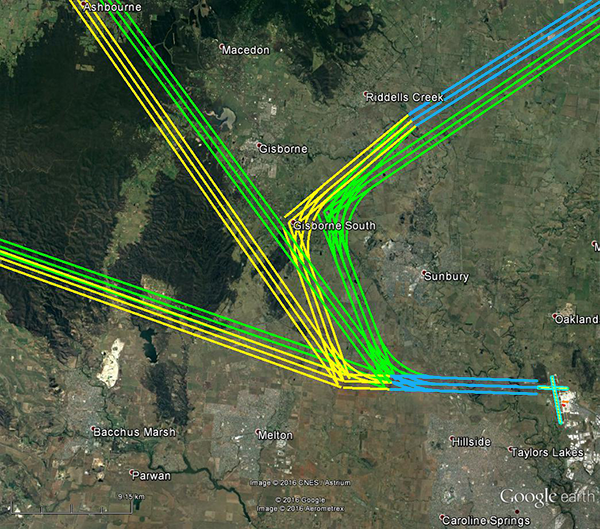 All Smart Tracking routes at Canberra are within existing long-standing flight paths. As part of the evaluation of Smart Tracking at Canberra, Airservices has analysed potential changes in aircraft noise distribution between 2011 and 2020 with and without Smart Tracking being used. The analysis assumes 85% of jets will use Smart Tracking by 2020. The information below includes forecast growth in air traffic to 2020. However, the analysis shows only any difference in the noise impact of aircraft which could be attributed to Smart Tracking. There are three Smart Tracking routes proposed to be made permanent for approaches to Runway 17. Track 1: Arrivals from the north. Track 2: Arrivals from the east. Track 7: Arrivals from the west. No residential areas are directly overflown by these tracks. They merge over farmland near Sutton and the final portion of the approach is curved away from communities in Gungahlin and North Canberra as much as possible. For all three tracks, there will be no measurable increase in aircraft noise attributable to Smart Tracking. There are four Smart Tracking routes proposed to be made permanent for approaches to Runway 35. Track 3: Arrivals from the northeast. Track 4: Arrivals from the southeast. Track 5: Arrivals to the southwest. Track 6: Arrivals from the northwest. No residential areas are directly overflown by these tracks. They merge over farmland near Hume/Tralee and the final portion of the approach is curved away from communities in Jerrabomberra as much as possible. This is expected to achieve a noticeable noise reduction for Jerrabomberra residents who live closest to the tracks. There will be no no measurable increase in aircraft noise attributable to Smart Tracking. Airservices will implement the following flight path changes at Melbourne Airport on 25 May 2017. There will be changes to the Standard Terminal Arrival Route for aircraft arriving to Runway 09 from the west to allow implementation of the Ground Based Augmentation System (GBAS) at Melbourne Airport. This new satellite based navigation system with ground based augmentation provides increased likelihood of landing in poor weather and improved protection from terrain for the newer jet aircraft. GBAS provides similar benefits to an Instrument Landing System (ILS). An ILS is not installed on Runway 09. An additional benefit of the change is that it has enabled Airservices, with the assistance of the Technical Noise and Environment Working Group, to move the existing flight path for arrivals from the west and south away from the Melton residential areas. Residents in the Melton, Hopetoun Park, Long Forest, Mount Cottrell, Gisborne South, Toolern Vale and western Sunbury areas may notice differences to where aircraft are tracking. 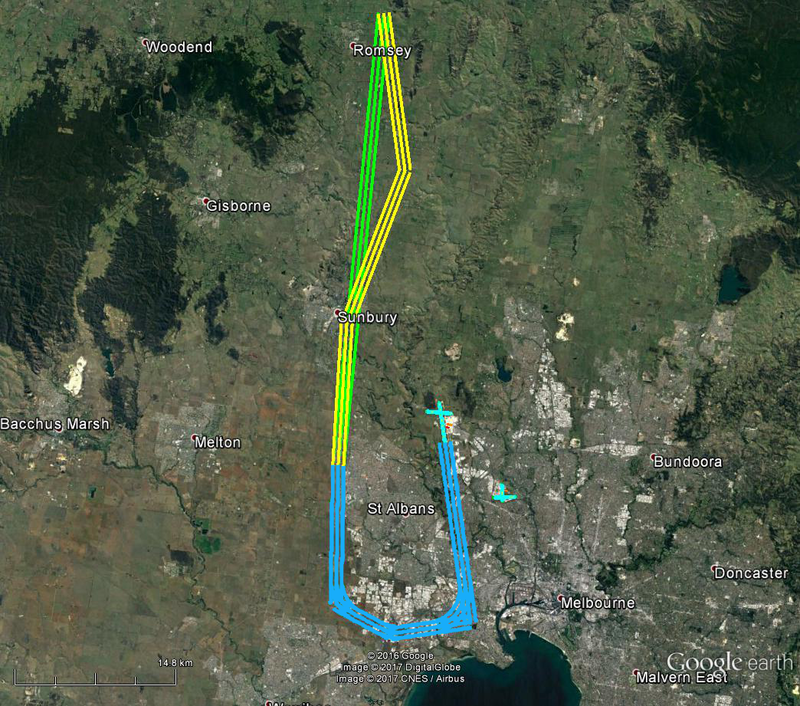 These flight paths will be infrequently used as the winds rarely favour the use of Runway 09. The changes will be over sparsely populated areas. Note that the flight path corridor over Melton residential areas has been removed post 25 May 2017. Aircraft departing Melbourne Airport off Runway 27 to the west will continue slightly further west before turning north over sparsely populated areas that are currently overflown. Aircraft are expected to be at around 4000 feet before turning. Runway 27 departures will extend slightly further west before turning north or north-west. 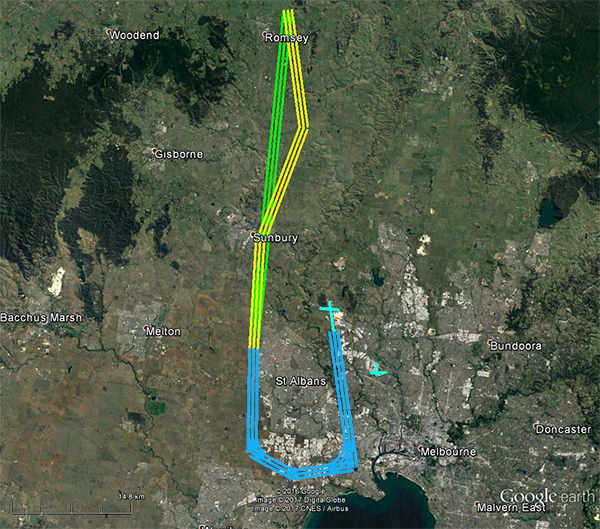 Aircraft arriving to Runway 34 from the north (in yellow below) will appear slightly to the east of the previous flight path (shown in green) in the Sunbury area with no noticeable change to noise impacts. Arriving aircraft will be within the same range of altitudes over the Sunbury area, between 8,000 and 10,000 feet. Aircraft departing Melbourne Airport off Runway 34 for southern destinations will continue further north before turning east and south over sparsely populated areas. Whilst aircraft will generally replicate the previous flight paths, there maybe be a small increase in numbers of aircraft flying along a more defined flight path as a result of this change. Aircraft will be less likely to spread over the Mickleham, Craigieburn and Kalkallo areas.